Hurley Haywood might have been a model. Graced with a trim frame, blond hair and Paul Newman-blue eyes, Haywood acquired the reputation of the most eligible bachelor in the world of racecar driving. Noted for his skill at driving endurance races (that is, races spread out over a period of 12-24 hours), Haywood took home the gold medal at the prestigious Le Mans 24 Hour Race three times, and is tied as the most successful driver in Daytona history, having won the 24 Hour Daytona race a whopping five times. 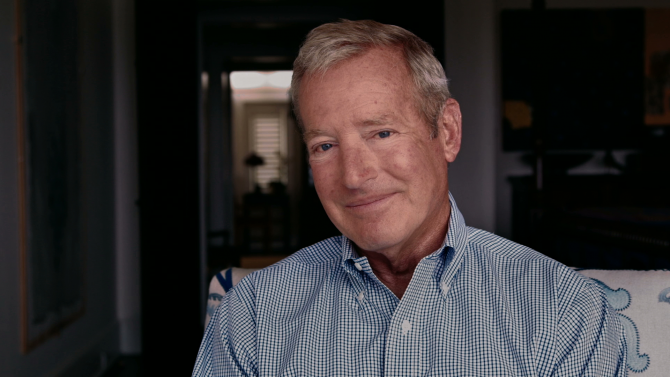 Now 70, Haywood’s blue eyes still shine and his perfect smile captivates. Introverted by nature, he made an unusually public announcement last year by coming out as a gay man and marrying his longtime boyfriend, Steve Hill. His career and announcement have now become the subject of the documentary Hurley. Produced by Haywood’s longtime racing protegee Patrick Dempsey (yes, from Grey’s Anatomy), the movie comes to streaming services March 26. Just before the Los Angeles premiere of the film, Haywood took a few minutes to chat with Queerty. When you’re interviewed in the film you’re nervous about coming out. What has the response been from those inside and outside the racing world? And we talked about a couple of places where he could go to get some support. He left with a really good attitude, and I never heard a word from him. Two years later I got a call from his mother. I had this sinking feeling that she was calling to tell me he had committed suicide. And she said, “I just want you to know what you told my son saved his life.” That coming from a mother is pretty heavy stuff. And I thought if my voice is strong enough to save one kid, maybe we can save two, or ten. Every 40 seconds an American commits suicide. Think about that a minute. You know, the young, gay kids are having a hard time. Today’s kids—the pressure on them is enormous, peer pressure. A lot of kids can’t cope with that, especially a gay kid who maybe has some effeminate traits or acts differently than everybody else. They’re a target for bullies. It’s hard for kids to cope with that. So I figured if I could give a positive image to somebody, that’s great. Have you heard more from that kid or his family? It’s a powerful thing, coming out. It’s still really shocking the effect it can have. Had you considered coming out earlier? No. There was no real need for it. It was not something–as you said, I was sort of uncomfortable talking about it in the beginning. But the friends that I had, both teammates, team owners and friends, knew I was gay. It was not something we necessarily discussed a lot, but they knew it and I didn’t have to hide it from them. I wasn’t worried about so much the racing community so much as the fans accepting it, and realizing I’ve idolized this guy and he’s gay!? I didn’t know if they’d be able to handle it. I was conscious of not wanting to upset my fans with it. But the result—the book and the movie—has been really supportive. I’ve not gotten really one negative comment from anybody, and I’ve had thousands and thousands of replies. I just have people come up to me and say “I always thought you were a great racing driver, and now I realize you’re also a great person.” That’s the biggest compliment I can ever get. Were there others? Other drivers in the closet? No. Again, it’s…you’re in a sport that has a certain image to it. I remember when Dale Earnhardt died and flags were at half mast. I wasn’t sure how people would react when I learned you were coming out. That gives me hope for the future. You know, I did an interview with Dale Earnhardt, Jr. at Daytona this year. I remember sitting in a trailer with Dale Sr., the year he was killed. He was asking me about what do I need to look out for, to be conscious of. And this is from a seven-time NASCAR champion. He was asking me what to do behind a race car. [Coming out] was something. I think the racing fraternity is a very open group. We are very supportive of one another. When times get bad, the whole community comes to the aid of that person. As long as you’re a good person, I don’t think it makes a difference if you’re gay or straight or pink or blue. But as I said, the fans are a different story. As long as I could keep them happy, I was happy. 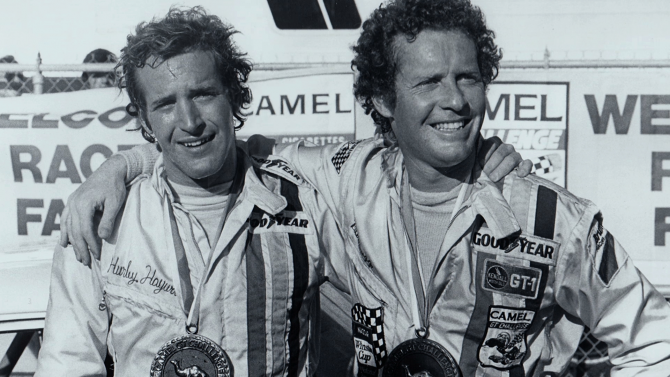 The center of this film is, surprisingly, your friendship with [legendary racer] Peter Gregg. Obviously, he had a huge effect on your career, and his loss has stayed with you. Were you out to him? That would fit with bipolar disorder. He was up and down, and it was that severe. So it was difficult to understand why this demon on his back was able to be so influential that he took his life. I think had he just opened up and talked about it, just like someone admitting that they’re gay, something that is difficult to talk about. It’s something you might be ashamed of, just like there’s a stigma around mental health. [There’s the feeling that] if you admit you’ve got a mental health problem, you’re admitting that you’re not strong. That’s not the case. It’s something that is wired a little differently, and you get these traits, and there’s medicine you can take that will control the desire and impulse to commit suicide. But you have to talk about it, and you have to let people know about it. He wasn’t willing to do that. He thought he was too smart to let medicine dictate his life. 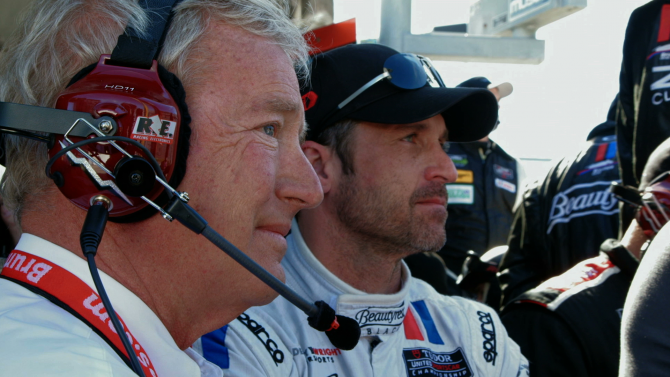 Speaking of mentoring, you’re passing your torch to Patrick Dempsey. How did you get hooked up with him? I’ve known Patrick for years since he’s been racing. First, he was racing with Mazda. Then we got him over to Porsche. That’s when we became friends and I sort of mentored him. He actually drove for our team in a couple of races. So our friendship grew, and then Derek Dodge—Patrick hired Derek to do a film on Patrick’s road to Le Mans. Derek then came to Patrick and said: “Doing this story on Hurley would be a great story.” Patrick totally agreed and offered to support it. So, it all came together. Derek actually came down to Jacksonville and we spent a weekend talking about it and what we wanted to accomplish. And he just started filming—literally. He’s got so much film it’s ridiculous. With digital film, you can just keep the camera rolling for 24 hours. It took almost four years for him to put this whole thing together. His husband, Will, is the editor. And it really came out quite nicely. So now you have a movie, a book, a career, a legend. What are you doing with yourself these days? Well, I mean, I’m busier now than I’ve ever been, even when I was racing full time. Everybody wants me to do stuff. I work for Porsche in their press department. I’m their ambassador worldwide. So that keeps me busy. I’m still involved with a dealership. The Field Group bought us three years ago, and they asked me to stay on. I have no ownership anymore, no real responsibilities, but they liked the association of me being there. So I told them OK, and they pay me. So it’s hard to say no. Nice living if you can get it. Hurley comes to VOD March 26. Don’t you mean My Husband instead? Sounds like Patrick is gay when you say his husband. I had the same response, but I figured it was just a slip of the tongue. He was referring to Derek Dodge. Patrick hired Derek Dodge to do the film on him, and then Derek Dodge asked Patrick to support the story on Hurly. It is Derek’s husband he is referring to. Thanks Hurley for being a good role model for the young and old gay community – too bad you didn’t have the courage to come out decades ago. Ego, greed, embarrassment are strong deterrents for staying in the closet. I don’t mean to belittle you, as times have changed, and public opinion has softened recently making it easier for you to accept “who” you are. Peace. Learn about history before casting shade on this guy. Back then on the race car circuit it was virtually impossible to even mention the word homosexual. He would have lost every sponsor and crew. Back then it wasn’t a matter of courage or not (yeah you slammed him) , it was more how stupid or not stupid you were. It reads His husband(comma) Will and it is talking about the person, Derek who is making the film. Read things fully. Thanks to this man for being such a nice guy and really not having to be on social media daily to make himself known like so many gay men today.